In an effort to promote the Red Bull Air Race series, Red Bull has once again resorted to what it does best… Making viral videos. 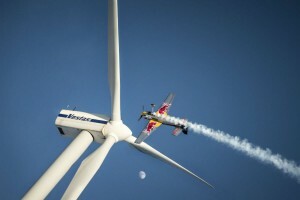 The energy drink company decided to have former Red Bull Air Race world champion Hannes Arch slalom through an Austrian Wind Farm at 185 mph. In the race series, pilots show off their skills by maneuvering around large inflatable pylons in small, single-engine stunt planes. However, when it comes to dodging wind turbines, one cannot afford to make a mistake, and especially at speeds close to 200 mph. If racing through an Austrian wind farm sounds like an odd location choice for Red Bull, take into account it’s all calculated. The next Red Bull Air Race takes place at nearby Spielberg, Austria next month.